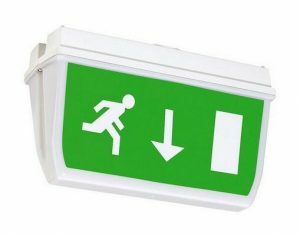 This Versatile exit sign luminaire is high-quality style,All-plastic enclosure with high tray and 2-sided labeling area . The terminals are designed for through wiring up to 2.5 mm ². The lamp is available as a wall , ceiling , chain , pendant , and cable assembly for single-sided or two- sided labeling. Construction according to DIN ISO 7010 2012 , EN 1838 and EN 60598-2-22 . This lamp is available for group / central battery systems as well as emergency lighting. and is available with DALI version. Self test and is available with DALI version.